Slice the mushrooms and rinse the black beans. Set aside. Next cut the cherry tomatoes in half, and dice the avocado, then transfer to a bowl. Add the corn, give everything a good squeeze of lime and stir until combined. Heat the olive oil in a frying pan over medium to high heat. Add the garlic and mushrooms and cook for 5 minutes, stirring occasionally. Add the black beans and cook for another minute, then stir the cumin through until all the ingredients are well coated. Remove from heat. Heat the tortillas in the microwave according to packet directions. 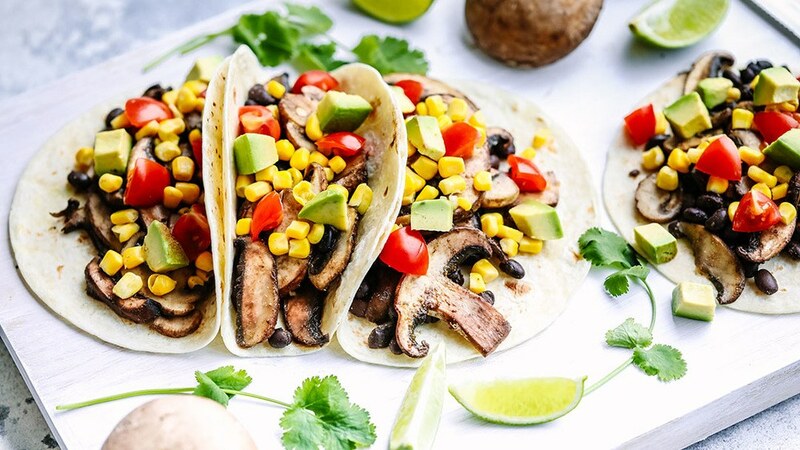 To serve, fill each tortilla with an even amount of the mushroom and black bean mixture and then top with the tomatoes, corn and avocado. Finish by garnishing each taco with coriander leaves.